Discovering a discarded children’s board game was the unlikely starting point for Alexandra Kennedy’s latest work,Primary Colours. Discovering a discarded children’s board game was the unlikely starting point for Alexandra Kennedy’s latest work, Primary Colours. The board game was made up of a collection of coloured rhombuses, repeated over and over again to form a children’s game. The game sparked a number of immediate associations for Kennedy, who was intrigued by the depth and ambiguity presented in a simple children’s toy. 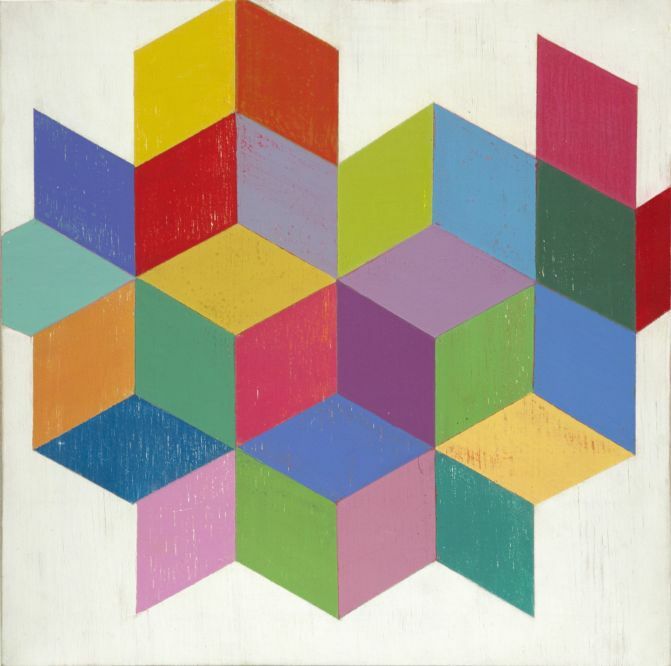 Some of Kennedy’s immediate associations included: Geometry/anti-geometry, inside/outside, two dimensions/three dimensions, concept/perception, system/intuition, idea/form, intellectual/practical, handmade (unique)/repetition and production/making. “The process of making - and the labour of work - is foregrounded in a series of paintings where slippages, and under and over painting, point to the process of making a painting, and the materiality of the physical object,” says Kennedy. The works, a series of acrylic painted on plywood, is designed to be hung together in a sequence. Since completing a master’s of fine arts degree in 2009, Kennedy has toured her work internationally on an annual basis, including a three month artist’s residency in Rotterdam, and a solo exhibition in The Netherlands. Having become known for her paintings about paintings, or “meta-paintings”, Kennedy also lectures in the history and theory of art at the Otago Polytechnic in Dunedin. At the moment Kennedy is preparing to help curate an exhibition as part of the Antwerp Art Weekend, and will also stage a solo exhibition in Paris in June, following on from previous work in the country.